Rurik has black hair and green eyes. His mustache and beard are kept neatly trimmed and is beard is braided so that it requires but a single silver beard clasp to keep it secured. His beard hangs approximately 2/3 of the way down his torso. The beard clasp depicts Ruriks' makers mark of an anvil with hammer standing on its handle in front of the anvil. His face is scarless. Rurik is in peak physical condition with barely an speck of fat on him. He is barrel chested and does not have the belly so many other dwarves do. When he is not wearing his armor he is dressed normally in an solid colored shirt that laces at the neck. He wears dark colored pants and wears black boots that turn down just below the knee. He wears a silver tipped black belt with an adjustable chest strap, with a silver buckle, that crosses his chest from the left hip to the right shoulder. The chest strap allows him to wear his Urgrosh secured on his back. He has a silver tankard that hangs on his right hip. A belt pouch is worn on the right hip behind the tankard. The Dwarven Urgrosh that he carries with him at all times is an ancient weapon bearing his clans ancient crest of an anvil with a crossed hammer and mining pick. 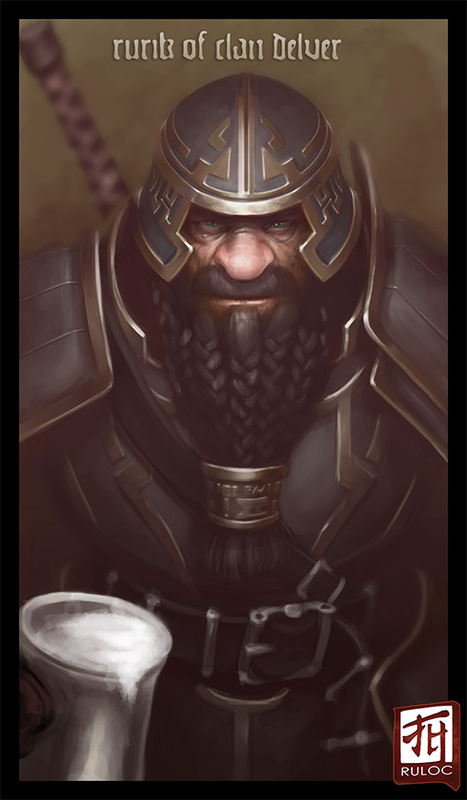 Rurik's armor is self made dwarven battle plate. The helmet does not have any horns on it and open around the eyes. The armor is crafted from the finest steel available and quite heavy. The armor is finished so as to cause minimal light reflection.